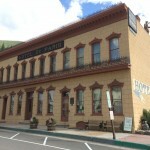 This house dates back to 1867 and is one of the oldest in Georgetown, Colorado, a once-wealthy town known as the “Silver Queen of Colorado.” The Hamill family made its fortune in the local silver-mining business. 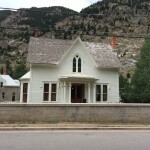 This house was considered one of the finest in the area, but it went into decline soon after the price of silver plummeted in 1893 and practically all local mines shut down. The one upside of that disaster is that the house remained pretty much the same ever since the 1890s, as the owners could no longer afford to update and change it to suit the styles of later generations. As a result, the majority of its original fixtures, furniture, wallpaper, etc. remain to this day. Several unexplained occurrences are said to have taken place at the house (which is now owned by the local historical society). At one time, while an independent film was being filmed there on location, an actress went to an upstairs bedroom (once used by Priscilla Hamill) to practice some operatic singing. She swore later that she saw a whooshing Victorian-era dress flit past the doorway while she was up there, and was astonished to learn later that she was the only person upstairs. Subsequent paranormal investigations claimed to have captured ghostly responses to questions via flashlights and other ghost-hunting paraphernalia. Tours are available. Fun fact – these Hamills are related to Mark Hamill, who played Luke Skywalker in Star Wars. I worked here in the Hamill House for 8 years spending hours in all areas of this home, day and night and never saw or heard anything. It is a happy but wonderful historic home museum. Please visit and enjoy!